Summer is ending and the school year is starting. Time for new shoes, haircuts, homework, and backpacks. As you do your back to school shopping, think about the backpack your child will be carrying. Sure, they load them up with books, but did you know that wearing a heavy backpack for a long time can actually hurt your child? The American Academy of Pediatrics (AAP) has provided some helpful guidelines for choosing a backpack for your child and avoiding the injury that can result from one that is too heavy. What are the health risks of a heavy backpack? Wearing a heavy backpack can strain the shoulders, back, and neck. As the child’s body tries to compensate for the extra weight, such as leaning forward, it can adopt positions that put the spine out of alignment. It can also cause the muscles to fatigue and weaken. This results in poor posture and a misaligned spine. The longer he or she carries the extra weight, the worse it gets. Over time, the child can experience pain, stiffness, and problems with flexibility and range of motion. This can significantly increase the child’s potential for injury. The effects may include back ache, sore or stiff neck, sore shoulders, and headaches. How heavy is too heavy for a child’s backpack? According to the AAP, a child’s backpack should weigh less than 10 to 20 percent of his or her body weight – and no more. However, a Consumer Reports survey showed that the lower end of the range, around 10 percent or less, is preferable. In short, the lighter the backpack, the healthier it is for your child. A good rule of thumb is to observe your child wearing the backpack. If they are stooped or leaning forward, it is too heavy. 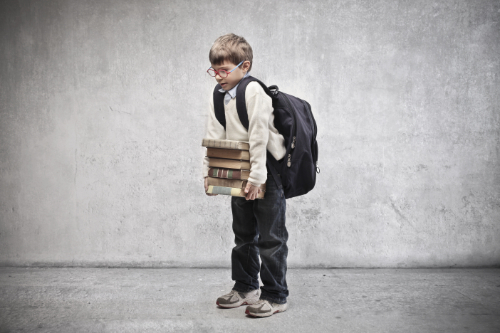 Children who are shorter, as well as girls, may be more prone to back pain caused by carrying heavy backpacks. This means that for these children you need to aim for even lighter weights. Children who are overweight may also be at risk for injury. The excess weight already puts a strain on their joints and muscles; the heavy backpack exacerbates the situation. Children who wear their backpack over one shoulder also increase their risk of injury. This puts all the weight on one side, causing the child to bend or lean in an effort to compensate for the off-kilter weight. This can strain the shoulder and back, eventually causing injury and pain. Helping your child avoid carrying a heavy backpack. If you notice that your child cannot stand up straight while wearing the backpack, then it is too heavy. You should inspect your child’s backpack on a regular basis to test the heaviness. When purchasing a backpack, aim for wide, padded straps that are adjustable. It should fit the child well and to be too big. The straps should not be too loose. You want it to fit close to your child’s body and should come to just below the waist – but not too far. Don’t allow your child to carry the backpack on one shoulder, encourage them to wear it on both shoulders. This distributes the weight more evenly. If your child is carrying a heavy backpack, you may need to talk to their teacher to see what is necessary for him or her to carry daily, and what can be left at home or at school. Work together to find ways to lighten the load and avoid injury. Also keep in mind, your child may not bring your attention to the fact that their backpack is too heavy. It is up to you to observe and intervene for them.